In a perfect, fairy-tale world, all the visitors to your social media accounts would be well-mannered princes and princesses who politely comment on your posts and tweets. Unfortunately, this is the real world, and sooner or later you’re going to run into a few nasty, unpleasant creatures: Internet trolls. 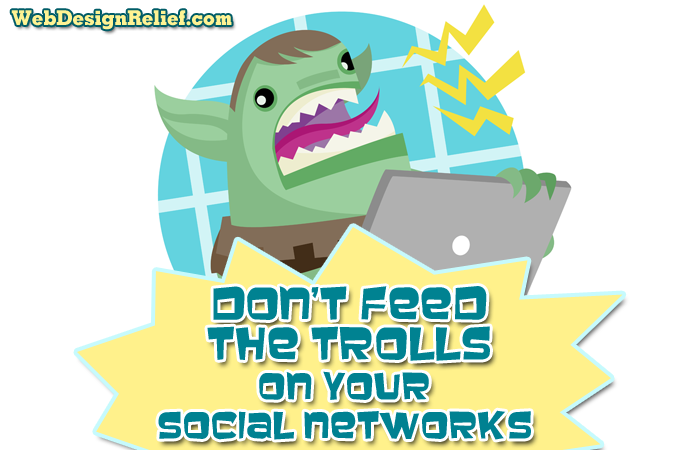 Internet trolls are (often anonymous) people who love to make negative comments and fuel online arguments. Rude, critical, and abusive comments can be especially tough for writers like you who have worked so hard to put your best foot forward and share your work with the world. So how should you deal with trolls and protect your online reputation? Step 1: Take a deep breath and don’t touch that keyboard—yet. Think before you act: Take some time to get cool, calm, and collected. If you compose a response before you’ve chosen your words carefully, you’ll just fan the flames and make the situation worse. Keep in mind that one person’s negative comment on your page will not ruin your writing career. Step 2: Never stoop to their level. Never fight trolls by becoming a grouchier troll. Ever. Before you give in to the temptation to dash off a scathing reply, remember: You have the opportunity to be the bigger person and add a little kindness to the world. Maybe your troll really is a jerk—or maybe he or she is a person whose life is not going well and who has chosen a poor way to vent built-up frustrations. Either way, your fans won’t applaud you for getting into a cruel, nasty, back-and-forth fight with someone online. And don’t let negative comments affect your writing tone on your website. Step 3: Refuse to take the bait. Some trolls will leave hurtful or inflammatory comments in an attempt to provoke you. It might be hard to resist the urge to defend yourself, but sometimes silence is better than starting a comment war. If you don’t feel comfortable completely ignoring a troll, consider offering a neutral response, such as “Thank you for sharing your opinion” or “Thank you for your comment” and leave it at that. When they realize they’re not going to get a rise out of you, most trolls move on. Step 4: When necessary, de-fang your troll. First, inform the commenter that their voice has been heard. Taking this step is very helpful to gently put off trolls who are making a lot of noise simply to get attention. Also, your kind acknowledgment could lessen hostility. Second, check to see if the commenter has an opinion you can agree with or a good point to make. You can level the playing field by affirming the positive points of the comment, and give you and your commenter some common ground. Third, make your gentle correction. Request that the troll refrain from using inappropriate language on your page. Or respectfully correct a misstated “fact” about you or your writing. Finally, end on a high note! Keep your tone light and friendly throughout the message. If it seems necessary, most social media platforms have a “block” function that you can use to prevent the commenter from posting on your page again. Twitter allows you to block a harassing user; in fact, now you can also block multiple trolls at once, as well as export and share block lists with your Twitter followers. Remember: Stay safe online! Trolls are an unfortunate part of the Internet experience; if you are active on a social media platform, they’re bound to eventually crawl out from under a bridge and attack. But now you know how to combat the negativity in a way that leaves them starved for the reaction they crave—and you can live (and blog, tweet, and post) happily ever after. QUESTION: What are some ways you might handle a troll’s comments? Good article, it’s a situation every writer who uses social media has faced, or will soon. Unfortunately, there are many trolls out there whose only purpose in life is to get a rise out of others at any cost. These people have no other outlet in life.